[08-May-18] Understanding the location and traits of phytoplankton is key to discovering their roles in the ocean ecosystem. 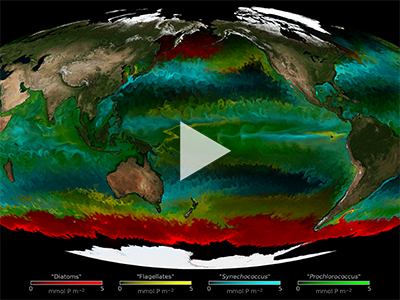 This video shows a model of the dominant type of phytoplankton across the ocean, as modeled by a high-resolution model known as MITcgm. The four colors (red, yellow, green and light blue) represent the most dominant type of phytoplankton at a given location. The red areas represent diatoms which are larger, silicate-dependent phytoplankton, and yellow are flagellate phytoplankton. The green areas correspond to tiny plankton such as Prochlorococcus, and light blue represents other small phytoplankton such as Synechococcus. Developed by MIT, the goal of producing these simulations and maps are to help us understand the diversity and distribution of plankton communities. These models can help us to explore the role of plankton in climate change, ocean ecology and as part of the carbon cycle.